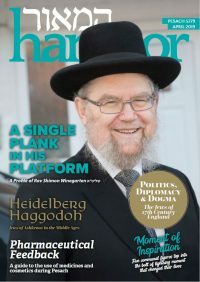 This edition of Hamaor should be reaching you sometime towards the end of March – chances are that Purim is already a distant memory and erev Pesach is creeping ever closer. But the work on the magazine you hold in your hands began many months ago, not long after the end of Succos, in fact. A group of Federation rebbetzins has undergone a training course to qualify as Mental Health First Aiders. In a first for the frum kehilla, the group spent two full days on a rigorous programme, which was interactive, thoughtprovoking and highly practical. 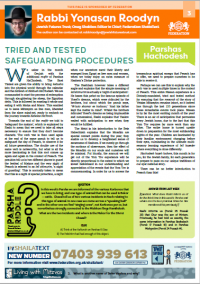 e usher in the month of Geulah with the additional maftir of Parshas HaChodesh. 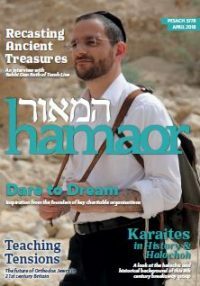 The Bnei Yisrael are given the ability to bring kedusha into the physical world through the calendar and the mitzvah of Kiddush HaChodesh. We are commanded to start the process of redemption through slaughtering the sheep, the Egyptian deity. This is followed by roasting it whole and eating it with Matza and Maror. This enabled us to leave Mitzrayim as free men, liberated from the slave mind-set, ready to embark on the journey towards Kabalas HaTorah. 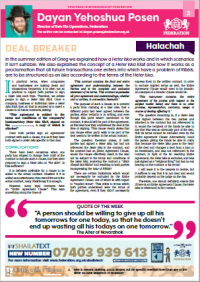 In practical terms, when companies and businesses are making deals and transactions frequently, it is often not so practical to expect both parties to sign a Heter Iska each time. Therefore, we advise people to sign a Heter Iska Klali. Once a company, business or individual have a Heter Iska Klali, then all that is required is to insert a clause in all future contracts, stating: “This agreement is subject to the terms and conditions of the company’s/ business’s/my Heter Iska Klali, signed on the ………………….., a copy of which is attached” Once both parties sign an agreement/ contract with such a clause, it is as if they have both signed a Heter Iska specific to that deal. 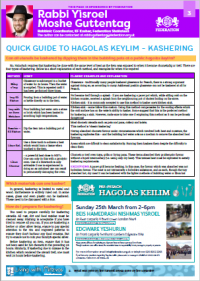 The annual Zayin Adar seudah of the Federation Chevra Kadisha was held this year at Edgware Yeshurun Synagogue. 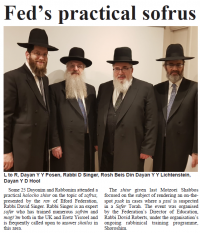 The seudah was attended by members of the chevra kadisha, representatives of the Federation’s shuls, dayonim, rabbonim and askonim from across the kehilla.